THE Government has launched an offensive to eradicate low wages and low standards in the cleaning industry. For too long, as Minister for the Environment and Water Resources Vivian Balakrishnan put it during this month's Budget debate, cleaners here have been earning Third World wages in a First World country. To set an example in 'best-sourcing', all public-sector bodies will soon be required to hire only accredited cleaning agencies. These are agencies that the National Environment Agency has certified as having in place proper human resource practices, such as sending their workers for training. Soon, cleaning companies will also be required to pay their workers 'appropriate wages' when there are productivity gains, to become or remain accredited. That is a big push to raise cleaners' wages, which have for years languished at $1,000 a month or even less. But these changes apply only to government contracts, which account for a tenth of the industry, and therefore are unlikely to prove a game-changer for the long-marginalised sector. 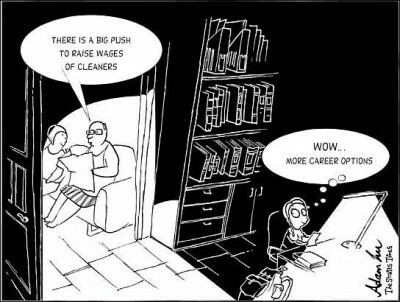 Two other factors limit the impact the changes will have on cleaners' wages. The first is the existence of numerous unaccredited agencies which do not rely on government contracts, and plan to stay that way. Of the 900 cleaning agencies in Singapore, only 60 are accredited. These are big players and employ 25,000 of the 70,000 local cleaners. In theory, once the big boys start paying more, market forces will push the overall wage level up. Unaccredited firms should see their cleaners migrate to better-paying jobs in the bigger firms. To stay in the game, these smaller firms will also be forced to pay better. But in reality, some will still get away with paying cleaners less because they can offer flexibility and convenience. According to official statistics, an office cleaner in 2010 made a gross monthly income of $800. Some bigger firms say that they are paying $1,000 to $1,200. Big accredited firms sign cleaners to a standard 44-hour week contract and deploy them all over the island. Smaller agencies accommodate cleaners who want to work only a few hours a day, or only on certain days in a week, or in a certain neighbourhood. There are also some workers who do not know that they can earn more elsewhere, or are fearful of giving up a steady pay cheque, however meagre, to find out. But small firms have a habit of being 'flexible' on details, like avoiding payment of workers' Central Provident Fund contributions or scrimping on cleaning materials. This is why the Ministry of the Environment and Water Resources is mulling over a licensing scheme, to set a minimum standard that all companies must meet before they can operate. Accreditation would then be a mark of quality one step beyond this. Such a two-tier system is already in place for the security industry. To get a licence for operation, all firms must meet criteria such as providing basic training for workers. Next, firms are graded annually from A to D.
There are merits to licensing, but any move to do so in the cleaning industry must not be so onerous on small firms as to put them out of business. Most are legitimate businesses that offer their workers flexible hours, like senior citizens or housewives who want to work only mornings so they can care for grandchildren after school. They take home less per diem, but it is still work on their terms - which an industry dominated by big firms may not allow. There is a second factor that limits the ability of accreditation to raise wages. This has to do with the difficulties in improving productivity. Under the enhanced accreditation criteria, 'appropriate wages' must be paid to workers when there are productivity gains. This assures workers of wage rises. At the same time, it limits unsustainable wage inflation: Without this condition, wage increases will lead directly to a brusque round of inflation for all consumers of cleaning services - that is, everyone. But industry players say most big contracts are designed in a way that creates disincentives for productivity improvements. For example, many specify a 'minimum headcount' of cleaners required. If an agency fails to provide this number of cleaners, then it may have to reimburse the service buyer 'liquidated damages'. The problem is there is no clear-cut method to evaluate the standard of a cleaning service. Many buyers of cleaning services thus resort to specifying 'minimum headcount'. The difficulty in setting standards for cleaning services also explains the race to the lowest common denominator. A clean table is a clean table, and no one will want to pay more for a 'premium' service for a clean table. So most customers, save a few exceptions, yield to the temptation to hire the cheapest bidder. And when a cleaning service is outsourced, cleaners become mere digits in customers' eyes. These calculations are easy to make, and easier for the conscience to avoid. With the industry's manpower shortage set to become more severe as its quota of foreign workers shrinks from 50 per cent to 45 per cent of staff strength in July, cleaners' pay is already on an upward trajectory. Managing director of ISS Facility Services Woon Chiap Chan paints a picture of where wages, without a liberal supply of foreign labour, could be headed. In Denmark, where his company is headquartered, a chambermaid makes in an hour what cleaners here make in a day. That day will come for Singaporean cleaners, he predicts. If that is so, there is every incentive to boost productivity in the sector fast. It is better to pay a few good cleaners well, rather than an army of unproductive cleaners badly. Accrediting cleaning agencies is a good first step towards that goal.